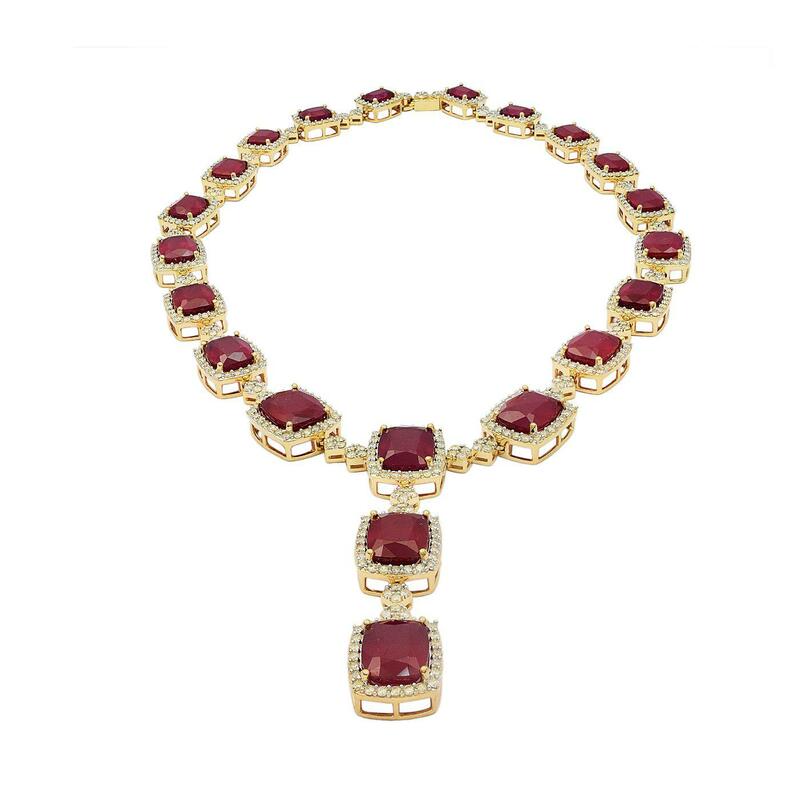 Electronically tested 14KT yellow gold ladies cast & assembled ruby and diamond necklace. Sixteen and three-quarter inch length necklace features a two inch length stylized ruby and diamond bezel drop supported by a flexible slightly graduating ruby and diamond bezel ribbon interspersed by diamond set quads, terminating in a concealed clasp with safety. Bright polish finish with rhodium accents. Trademark is Orianne. Identified with markings of "14K". Condition is new, good workmanship. Twenty-one prong set rectangular cushion mixed cut natural rubies approximate total weight of 88.44ct., clarity is heavily included, type II, dark, very slightly brownish, slightly purplish red color, (GIA slpR 7/3), cut is good. Transmitting light somewhat diffusely, transparent to translucent. Naturally occurring internal & external characteristics are present. Indications of laboratory high temperature heat treatment, with glass & flux additives. Color grade is an average for the group. Graded in the setting. Six Hundred Twenty-Eight prong set round brilliant cut diamonds approximate total weight of 628 Stones = 9.23ct. The color grade reflects the entire range of color for this group. Graded in the setting.